Buffalo turf sold as instant turf in rolls or slabs saves big dollars compared to other landscaping solutions, especially in residential homes. In surveys, people often think lawn will cost them $20 or more per square metre. 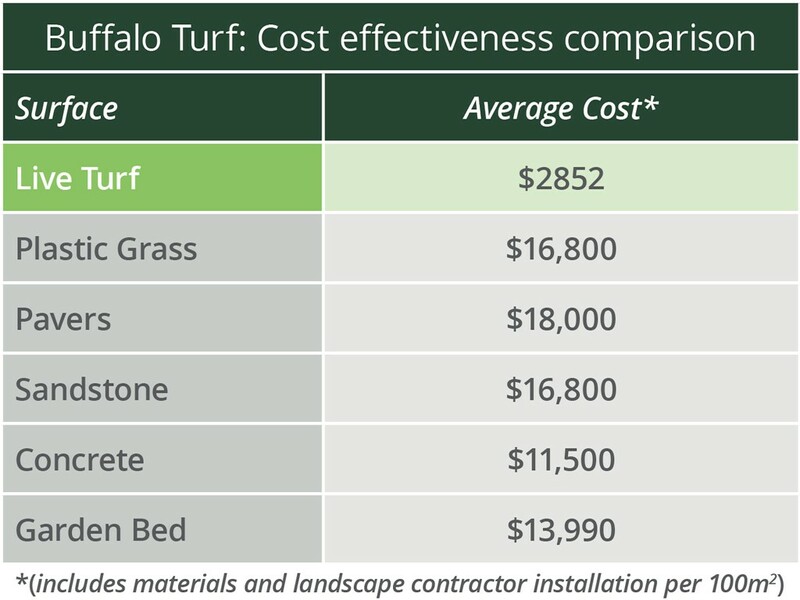 The average price of Buffalo turf without installation is around $10, half of what people think. Compared to other landscape solutions, which are usually $25 to $40 per square metre, Buffalo turf is great value. According to research done by Turf Australia, the Landscape cost to do a full installation of turf, including preparation, soil, and turf using a landscaper is on average $2852.50, whilst the average cost of alternative like gardens are $13,990 and pavers is $18,000. The table shows turf compared to other ground cover products, based on averaging the low estimate and high estimate using a landscape contractor. If you do it yourself, you can obviously save money. But even using the services of a professional, you will save dollars by increasing the amount of Buffalo turf in your landscape. The benefits of Buffalo turf compared to other surfaces and other turf types are numerous. These days you would think all lawns are Soft Leaf Buffalo’s, but unfortunately some can still be scratchy, and microscopic photos have shown some fail the soft test. We won’t mention those, but we will tell you the soft safe ones. Prestige® Buffalo (A soft broad leaf with amazing winter colour): Is one of the best and newest Buffalo grasses on the market. It is known for it’s consistent deep green colour, hard wearing, good recovery and drought tolerant. An exceptionally good-valued Buffalo. Sapphire® Buffalo (Very soft finer leaf that folds in half): Was rated as number one Buffalo in shade in independent Horticulture Innovation and Department of Primary Industry trials. Recovers from wear well. Low thatch type, with good winter colour. The folding of the leaf often protects it from frost. Good value Buffalo. Palmetto® Buffalo (Soft leaf, dark green, low maintenance): This is the Buffalo to go for if you do not want to mow or edge as much. It will cope with most wear requirements. Its dark green colour makes it stand out. Others: Not all are soft leaf, some are some are not, so be careful using other less proven types. There are a couple of options to choose from when it comes to installation of your new Buffalo lawn. Firstly, you may prefer to sit back and let a landscaper do all the work. Sometimes it is easier to work hard, earn money and let professionals do the turf preparation and installation. If you are more of a do-it-yourself type of person there are two ways to install your new Buffalo. The first option is to spread topsoil. Simple, but can cause layering, and reduce quality. First kill-off existing grass with glyphosate. Then spread 75mm of topsoil, preferably with organics in the soil blend. Rake smooth and lay the turf. This has been the traditional method for a long time, but having compact soil underneath is not good. A way to make this option better is to rotary hoe or use a skid steer to loosen the soil first before spreading the soil. Secondly and the best method. As usual the best method is more work. Kill existing lawn with glyphosate. First get a pH kit, which can be bought and test the existing soil. They are low cost. If your soil is acidic, you can increase its pH with a lime product sourced from a Nursery. If your soil is alkaline, you can decrease the pH with Iron Sulphate. Put your additive, if needed, over the top of the soil. Buy in 50mm of organic mix, and spread over the top. Then using a rotary hoe, mix the organics, and loosen the soil below. If you have a smaller rotary hoe, hoe the soil first, then spread the organic mix on top, then again mix the components together. The key is to have a uniform substrate to lay the turf on. Rake even, and lay the turf. Alternatively, you can use a skid steer to rip and loosen the soil, spread the organics on top, and use the teeth of the skid steer to mix it altogether, hopefully without compacting it too much. Even the substrate, then lay the turf.